Join Our VIP List Sign-up for real estate updates. changes and exclusive real estate information! How can we help? Fill out the form and we’ll get back to you shortly. Hawaii is paradise, no matter where you look. It’s the best place to spend a tropical holiday. The entire state is simply a showcase of impeccable natural beauty and rich culture that’s worth discovering. There’s so much of Hawaii to see – and so many ways to see them! For a truly unforgettable holiday, you must discover the best views from the most unlikely angles. Take to the skies on a helicopter tour and enjoy a bird’s eye view of Hawaii’s rolling hills and valleys, verdant coastal cliffs, and sparkling streams and waterfalls. You can even watch the breathtaking lava flow from the Big Island’s Kilauea volcano from the best view yet – on top of it. 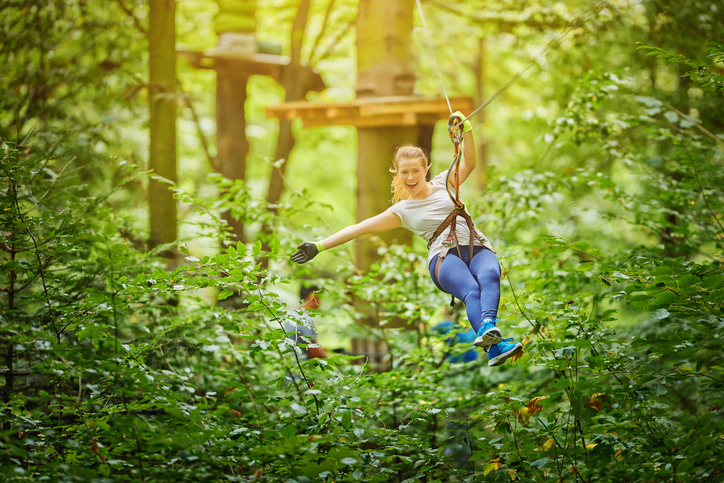 For a similar, more exhilarating experience, try ziplining. The most spectacular zip line facilities are in Kauai, Maui, and the Big Island. Some even offer combo packages that throw in scenic bike tours or refreshing dips in sparkling natural springs after your thrill ride. Hawaii has something for every golf enthusiast, from the experienced player to the newbie. There is an abundance of exclusive courses and country clubs, as well as courses open to the public. Either way, expect pristine greens, immaculate playing conditions, and a luxurious ambiance as you play. Memorable rounds of golf come with picturesque, 360-degree views on these sun-kissed islands. Living in Hawaii gives you the chance to feast on great food to keep your diet clean and healthy. Farmers’ markets are excellent opportunities to discover new flavors and items. Juicy tropical fruits, organic vegetables, free-range meats, and fresh seafood abound. You’re sure to find all sorts of spices, too. Farmers’ markets are fun social events for your community, as well. It’s a great venue for catching up with neighbors and for making friends with your local farmers. Better yet, if you have a free weekend, visit a local farm. There are plenty to choose from in Maui, Oahu, Big Island, and Kauai, each offering a unique experience. Hawaii is a hub of exceptional biodiversity. Everywhere you look is an opportunity to see the beautiful plant and animal species. Hop on a boat to witness the migration of the magnificent humpback whales. Put on your snorkeling or scuba gear to explore the thriving reefs. Bring your binoculars along on your next peaceful trek. Stay close to all the action by buying the home of your dreams here. Explore the finest Hawaii luxury homes for sale with me, Greg Burns. Call me today at 808-214-0302 or send an email to Greg(at)IsleLuxury(dotted)com. I’m excited to show you around this delightful locale.